Overall Print Size: 27" x 22"
Captain Don Gentile and Lieutenant John Godfrey are depicted on 16 March 1944 during their target support mission to the outskirts of Munich. Assigned to B Flight in the 4th Fighter Group's 336th Fighter Squadron, Gentile and Godfrey would become the 8th Air Force's most celebrated fighter element by virtue of their mutually supportive tactics. Heralded by the Air Force as the top leader/wingman duo in the European Theater of Operations (Winston Churchill referred to them as the "Damon and Pythias of the 20th Century"), the two would combine to shoot down 16 enemy aircraft between 8 and 29 March 1944, including six on one mission! The pair would not hunt together on this day, however, as Gentile's "Shangri-La" would be forced back to Debden due to engine troubles that would keep it out of action until early April. 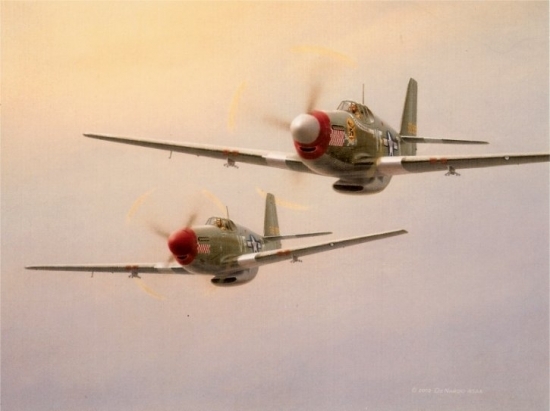 While they would fly together again, this was the fourth and final mission in which the two would participate in their now famous personal P-51B Mustangs. Gentile would take VF-T into combat on only three more occasions, downing three FW-190's on 8 April. Godfrey would fly VF-P through 5 April at which time it was removed from service. Gentile ended the war with 21.83 aerial victories to his credit and Godfrey with 16.33 aerial victories.